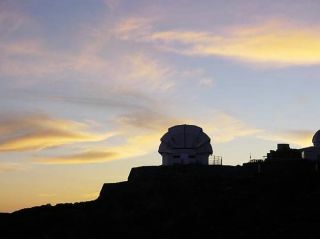 The Liverpool Telescope on the Spanish Canary Island of La Palma. The death of one star can sometimes outshine a galaxy ofbillions of stars. That's because when some very massive stars end their livesin supernova explosions, they release a surge of light known as a gamma rayburst. Now scientists have found evidence that magnetic fields arebehind these rare events. Theorists have predicted that magnetic fields couldexplain how gammaray bursts (GRBs) produce jets of bright radiation that shoot out into theuniverse. But no one has observed the presence of a magnetic field in a gammaray burst until now. On Jan. 2, 2009, a gamma ray burst erupted and was quicklydetected by NASA?sSwift satellite, which makes continuous scans of the cosmos in hopes ofcatching one of these outbursts, as they generally last only seconds. Swiftreported the burst immediately to telescopes around the world, and the roboticLiverpool Telescope on the Canary Island of La Palma automatically beganobserving it. The telescope was fitted with a filter that detectspolarized light, or light that is electrically and magnetically aligned in acertain direction. Indeed, the observatory found polarized light in the gammaray burst signature, which told the researchers that the light originated in amagnetic field. "This breakthrough observation gives us the firstmeasurement of magnetic fields in the afterglowof a GRB," said Swift lead scientist Neil Gehrels of NASA?s GoddardSpace Flight Center in Greenbelt, Md. The researchers ? led by astronomer Iain Steele, director ofthe Liverpool Telescope and a professor at Liverpool John Moores University in England ? published their findings in the Dec. 10 issue of the journal Nature. "This is a first indication that magnetic fields arevery important [in GRBs]," Steele told SPACE.com. "I think this is agood step forward to understanding the energetics in the jet and the role ofmagnetic fields." Gamma ray bursts only occur in a small subset of supernovas,and astronomers think they might be associated with the deaths ofmore massive stars. The researchers hope to observe more GRBs in the futurefor confirmation of the presence of magnetic fields, and to learn more aboutwhat powers these luminous eruptions.